Biaxin (Clarithromycin) kills certain bacteria or stops their growth. It treats ear, lung, sinus, throat and skin infections. Biaxin is also is used to treat a certain bacteria that can cause stomach ulcers, but will not work for colds, flu, or other virus infections. 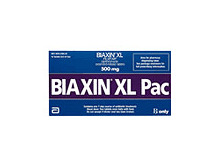 Do not take biaxin if you have any of these conditions: diarrhea, irregular heart beat or abnormal heart beat, kidney disease, liver disease, stomach problems (especially colitis), other chronic illness, an unusual or allergic reaction to clarithromycin or other macrolide antibiotics (such as erythromycin), foods, dyes, or preservatives, pregnant or trying to get pregnant, breast-feeding.